You and your boyfriend have gone your separate ways, but you still love him and want him back. 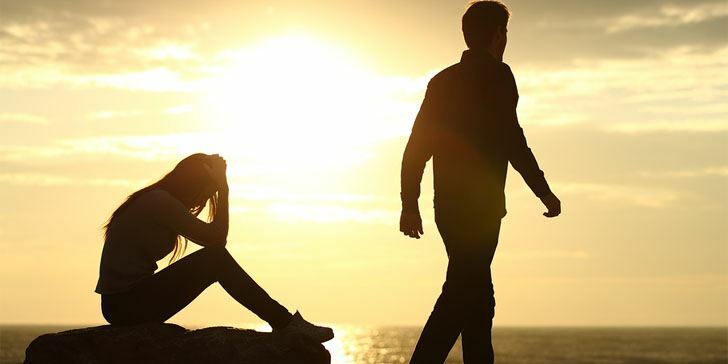 If you’re holding out hope that you might get back together one day, at some point you may find yourself facing the gut-twisting realization that he seems to be getting over you. Maybe it’s a gut feeling, maybe a friend tells you something she heard, or maybe his social media activity has been making your heart sink. If it seems like he’s having a blast or he’s with a new girl, it can be hard to watch. But the fact that he’s moving on doesn’t mean all hope is lost. You can almost always get him back, you just need to know what to do, and that’s where I come in. Can I get him back if he’s over me? This is the biggest fear of any woman post-breakup—the fear that he’s moved on and she is long forgotten. How can you know if he has? You don’t know what’s going on in his head, and there’s no way to know unless you get inside his head, and that’s impossible … so you just can’t know! It’s especially frustrating because his behavior can’t always be simply explained. It can appear from the outside that he’s moved on, but maybe he’s just trying to escape the unrelenting pain of losing you. The fact is, he may seem to be totally fine and moving on, but he most likely isn’t. Pain doesn’t just evaporate after a breakup, even if he was the one who broke up with you. And even if this doesn’t seem to apply, don’t panic. You don’t know what his behavior really means. Chances are he is trying to move on … but again, that doesn’t mean it’s easy for him or that he will, and even if that’s where things are headed it doesn’t mean you can’t get him back. Keep reading to hear the biggest signs he’s trying to move on and get over you, the signs he’s still secretly in love with you, and exactly what you can do to get him back either way. 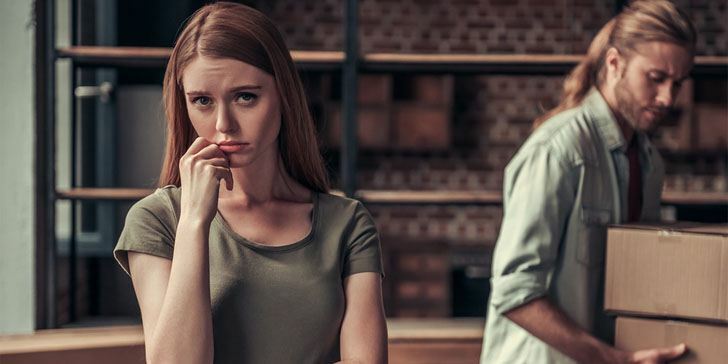 If you’ve been broken up for a while and he’s been dating someone seriously and exclusively for a long time, then he most likely has moved on. But even though a new relationship might mean he’s moved on, this isn’t always the case. You need to take the full context into consideration. If he dives straight into a new relationship and they’re moving at lightning speed, it’s most likely a rebound relationship, and this means he’s not over you, no matter how happy he appears to be. The faster he gets into a new relationship, the more likely he misses you and is trying to deal with his pain. Being in a new relationship will plug up all his emotional voids and help him forget you. At the same time, he gets to feel desirable, manly, connected. He gets his physical and emotional needs met, even if it’s in a very superficial sort of way. He basically has an escape from dealing with his own thoughts and emotions. But he can’t hide forever. These things will catch up with him eventually, and at some point, he’s probably going to realize he wants what he had with you back. Now, this is a tough line to argue with. You can make a case for any other breakup line he feeds you except for this one. What is there to say? It’s “him” not you, so that’s that. Just like you can’t get inside his head, you can’t argue with him about who he is or what he wants. This is basically his way of saying: stop trying to make it happen, it’s not going to. This is him trying to move on, for sure, but it’s also him not wanting to hurt you and trying not to lay blame on anyone. He wants closure and he wants to avoid a painful conversation, but that doesn’t necessarily mean he’s over you. One of the most concrete steps you can take to start getting over a breakup is to get all your stuff back and return the other person’s stuff so there is no trace of them left behind. If he’s done this, it’s his way of closing the book, not leaving any loose ends or any opportunity for you to pop back into his life. This could be because he is genuinely done with the relationship, but it could also be because it’s too painful to have reminders of you all over the place. All warmth seems to have left the building. When you talk to him now, he seems like a cold stranger who wants nothing to do with you. This could mean he’s totally over you and he just doesn’t have any of those loving feelings left, but it could also mean that he does have feelings, but he doesn’t want to face them, or he’s trying to force himself to move on by freezing you out and going emotionally cold. Men can compartmentalize very well, and what he may be doing is putting his feelings for you in a box and sealing it shut as a self-protective measure. Most women can’t do this, so we naturally assume he no longer cares, that all warm feelings have truly evaporated. But like I said, context is key. You need to take this into account along with all the other signs combined. If he’s really mean, maybe he’s still angry about things that happened and this is how he shows it. This is likely if you cheated on him or betrayed him in some significant way. He might just need more time to deal. The best thing to do is just give him space—you being there and trying to make it better or trying to apologize or trying to get him to be emotionally responsive to you will just make everything worse. You never hear from him anymore. If you do speak, it’s because you reached out first and initiated the conversation. He may be pleasantly responsive, but he never makes the first move. The biggest advice we give to anyone going through a breakup is to follow the no contact rule for a period of at least four weeks (more on this later in the article). The no contact rule can be used to either get your ex back or to enable you to fully move on after a breakup. Either way, you end up in a better, happier place. If he’s freezing you out, it’s possible he’s going through a period of no contact for himself. If he just never gets back in touch, then he most likely realized this relationship isn’t right and he is moving on. Does it mean all hope is lost? Not necessarily, but we’ll get to that later on. Unfriending or unfollowing someone on social media feels strangely permanent even though you can re-follow with just one quick click. But anyway, it’s another one of those physical things we do to emotionally move on. Getting physical distance from someone in this day and age is harder than ever because even if you never see or speak to them in person, you can still know exactly what they’re up to at all times thanks to social media. So, if he makes an effort to completely cut himself out of your “story,” it’s because he’s trying to fully move on. At the same time, it’s also possible that he just doesn’t want to be reminded of you at every twist and turn because it’s too painful. Most of the time when you talk to an ex, you can’t help but fall back into familiar habits and ways of relating to each other. There may still be a lingering attraction and desire, and so you flirt. If he’s not even a little flirty, it’s a big sign he no longer desires you in that way and he’s totally done. Or, as I mentioned earlier, he may be compartmentalizing to make being without you easier on him and to help him get over you, or he may still be angry and not flirting is his way of being cold. Context is key. When a guy flat out tells you to move on, it’s usually because he’s moved on himself and he doesn’t want you to hold out hope anymore. He still cares about you and sees that you’re still hanging on and he wants to set you free if he can. He might be tired of your efforts to win him back, or tired of seeing you hurt and upset. He may also say things like you “deserve better.” We’ve all heard of that famous line. What he really means is he knows he’s incapable of treating you right and giving you the love you want because that’s just not how he feels. If he tells you to move on then he’s either completely moved on himself, or he’s trying to and knowing that you haven’t is making it harder on him because he still has feelings for you. He may not have moved to get away from you—maybe he just graduated, maybe he got a new job, or maybe he wants to live in a warmer climate. But if he moved away, it’s a sign he has no desire to get back together and he’s most likely moved on. Think about it: if the relationship didn’t work when you were in the same vicinity, why would he add another obstacle to the mix? So If he moved far away, chances are he’s moved on and won’t want to pick things back up again. You’ll need to factor this into whether it’s worth trying to get him back. Long-distance relationships are hard enough even when things are going well. Trying to regain something with him when he’s not even in the same location will be extremely difficult. In addition to giving you the bare minimum when you reach out, he isn’t receptive to your attempts to meet up and hang out. If he seems more annoyed by you than happy to hear from you, this is a really bad sign, and you’ll have to proceed carefully. This is a sign that he’s much further along the path of “moving on,” and it’s better if you don’t let it get this far before you try to fix things. What hurts more, getting punched in the face or hearing the man you love say, “I don’t love you anymore.” Well, I’ve never been punched in the face, but I’m going to call this a tie. So does he mean it? Well, that depends on a few things. If you were together for a long time and recently broke up, he definitely doesn’t mean it. Love doesn’t turn on and off like a switch. It takes time to fall in love, and it takes time to fully fall out of love. If it was a short relationship, and it’s been a while since the breakup, he most likely does mean it and he is over you and moving on. You’ll need to ask yourself why you’re investing so heavily in something that didn’t last very long, with a guy you don’t even really know that well. Now that we’ve looked at the signs your ex is moving on (or at least trying to!) let’s look at the signs your ex still loves you. If he’s exhibiting any of these signs, it’s possible that stuff he’s doing that makes it look like he’s moved on is really stuff he’s doing deliberately in order to force himself to move on and get over you when his heart’s not in it. If this is what he’s doing, that leaves a lot more opportunity for you to fix things and get him back. 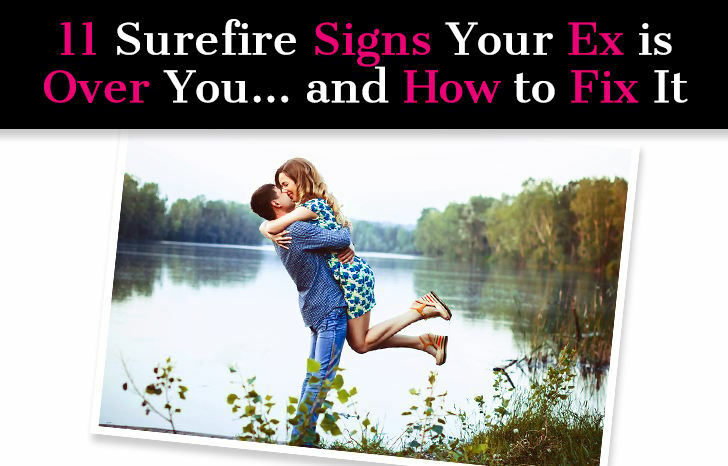 The signs he’s over you and the signs he still loves you can look the same … talk about pouring confusion on top of a pile of confusion! 1. He has strong emotional reactions when it comes to you. He’s extremely happy to see you, he gets really upset when he can’t, and he gets insanely jealous when you talk to other guys. Basically, he can’t keep his emotions in check when it comes to you. 2. He drunk dials/texts you often. Alcohol doesn’t always bring out the truth, but it does bring out emotions and lower inhibitions. If he still has feelings for you, they will spill out when he’s in that state. 3. He contacts you even if you asked him not to. When we love someone, we just can’t keep away, they have a strong gravitational pull over us. 4. He tries to make you jealous. He’s suddenly posting non-stop on social media, whereas he used to post once every few months. New pictures are of him having the time of his life, or surrounded by girls. This is an obvious plea for a reaction out of you. 5. He runs hot and cold with you. This ties into him being emotionally all over the place and having intense feelings about you. Should You Get Your Ex Back? I’m going to tell you how to get him back, but before I do, and before you get anything back, you need to take one giant deep breath and do a relationship inventory. – How did I feel in this relationship? Did it feel light and effortless? Or strained and filled with tension and like I was always forcing things to work? – What did I learn about myself in this relationship? – In what ways did this relationship bring out the best in me? – In what ways did this relationship bring out the worst in me? – Why didn’t the relationship last? What are the real reasons, not just the surface reason(s)? – Do I honestly think we can solve our problems? – How will a second time around be different? – If I don’t get him back, what did I learn in this relationship that I can take with me to my next relationship? – What did I do in this relationship that I will never do again in a relationship? Spend time asking yourself these questions and really be honest with your answers. This is one of many reasons why it’s imperative that you follow the no contact rule. It will be pretty much impossible to be objective if you’re still in contact with your ex. You can’t see clearly through a cloud of confused emotions. You must engage in a period of no contact for at least four weeks, also known as the no contact rule. 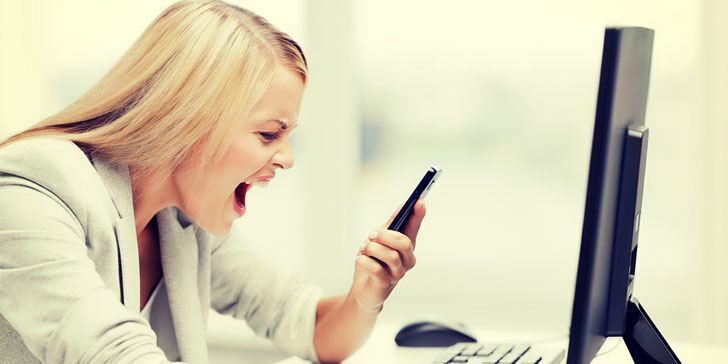 It is as it sounds, you do not contact your ex via any channel, and you do not reply if he contacts you. I’m not going to get into it further here because I’ve written about this extensively so make sure to read this article next: Everything You Need to Know About the No Contact Rule. What do I do after the no-contact period? The no-contact period will give you a lot of clarity and you will probably discover exactly where you stand with your ex. He most likely will reach out to you, but what if he doesn’t? Should you reach out to him? What should you say? Don’t worry, I’ve covered all of this and much more. Once you’ve done a relationship inventory and really given yourself time to think about whether or not you should even try to get him back at all, it’s time to act on that newfound knowledge. If you’re sure you want him, there are concrete steps you can take to make it happen. Here is my complete guide to getting your ex back. This article has everything you need to know to get him and keep him for good this time.